﻿﻿﻿﻿WHAT IS ﻿WEAR IT FOR CCF? WEAR IT FOR CCF is a fundraiser to help CCF introduce kids to cycling and provide meaningful programs for youth through sport. Donate at the $125 level and get this SPECIAL EDITION JERSEY. 100% of proceeds fund CCF's mission. 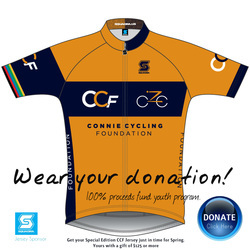 SQUADRA has generously donated jersey's to our fundraising campaign. This means your entire donation goes toward youth programs. How great is that! During this campaign, cyclists througout the U.S. will be showing their support and shared belief that changing lives through cycling matters by donating and wearing this jersey. Only available to CCF supporters! Ride in style! This design was created special for outreach purposes and is worn by riders that support the CCF mission. The classic band across the chest distinguishes it from the matching but slightly different V-design worn by CCF racers. After your donation is processed, you will receive an email that contains instructions for claiming your jersey. In the email, you'll be asked to select a size and provide a Ship To address. Review the Jersey Size Chart below. Remember... not all manufacturer sizes run the same. SQUADRA headquarters is in Carsbad, CA and their gear can be found on cycling and triathlon professionals around the world. ﻿Want to WEAR IT FOR CCF but you don't wear jersey's? How about sporting a t-shirt to demonstrate your support.